Eschewing dramatic scores for the sounds of the everyday, the movie sets up a feeling of loneliness and solitude. This is further accentuated by the clinical whiteness of the moon bunker, echoing Sam's state of mind. For a movie shot in 2009, it has a remarkably retro feel to it - some scenes almost paying homage to The Clockwork Orange. The viewer is successfully pulled into the brooding world of Sam, and as things go bad for him, cannot help but internalize his struggle for existence. The movies under-emphasizes the science part with almost no reference to the "how" beyond what is strictly required for the plot to unfold. In doing so, it brings two actors to the forefront - man and the unknown company that put him alone in the middle of the Earth's lone satellite. In essence this is a story about the struggle of man - against the elements, against the upcoming resource crunch on Earth and against the ever present greedy corporation. Yet it doesn't turn preachy or Luddite but is a rather uncomfortably personal exploration of these themes. 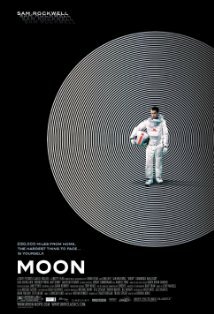 It is almost required by space movies to have references to the grand daddy of them all - 2001 Space Odyssey, and the Moon does not disappoint with parts of the set, the daily activities and GERTY resembling HAL 9000. Shot with a budget of $5 million, this is no Space Odyssey, but is nevertheless an absorbing tale.